Auction of household contents by Sir Maurice Fitzgerald, bart. Severals House is best known to many as being the offices of the Newmarket Urban Dirstrict Council (Newmarket UDC). The earliest record for the council being in Severals House seems to be a newspaper report in 1948, but the exact details and reason for their moving here has not yet been found. Newmarket Urban District Council Tenders for converting various Nissen and Brick-built Hutments on Sick Quarters R.A.F. Site (54 M.U.) intr No. 11 Temporary Dwellings. THE Newmarket Urban District Council invites Tenders for the above works Specification and Bills of Quantities can be obtained from H. G. Kenyon. L.R.I.B.A., Chartered Architect, Council Offices, Severals House, Newmarket, or, payment of a deposit of £2 0s. 0d.. which will be refunded on receipt of a bona fide tender. Plans and general conditions of Contract may be inspected upon application to the above office. Tenders in plain sealed envelopes endorsed "R.A.F Hutments Sick Quarters" must be delivered to the undersigned not later than 11 a.m. Wednesday, September, 1948. Imported Labour: The submission of a tender will be deemed an undertaking on the part of the Contractor to provide all necessary labour for the carrying out of the works and should the Contractor be unable to recruit local labour he is to include in his estimate for importing labour. Following the Redcliffe-Maud commission and the Local Government Act of 1972 the administrative districts were changed and the Newmarket UDC was replaced by Forest Heath District Council. The council offices were then moved from here to Mildenhall in 1974 (although rumour has it that the change of location was known about well before that date; when a prospective employee at Severals House was asked 'did he mind living in Mildenhall?'). On the topic of where were the UDC offices before they moved to Severals House? - the extract below is from the planning application made by Dr. Clement Frederick Gray, of Lushington House - No.119 High Street, for the building of his new surgery of Alton House - No.117 High Street. 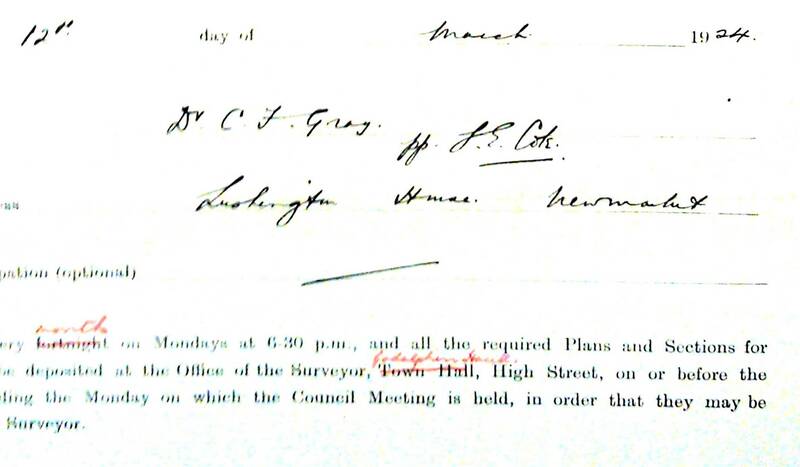 The document is dated 12th march 1924, and on there you can see that the council's officers have crossed-out 'Town Hall' and in red ink put in 'Godolphin House'. So the inference from this is that the council had very recently moved from the Town Hall - No.29 High Street to Godolphin House - No.115 High Street. Coincidently Godolphin House is right next door to Alton House - the building on the corner of the High Street and The Avenue. The monthly meeting of the Newmarket Urban Council was held in the new Council Chamber at Godolphin House. The Chairman said the rooms were more convenient and healthier for the Council and their staff than the old Town Hall where the staff were labouring under great difficulties. Council might expect that under better conditions they would get more work from the staff. 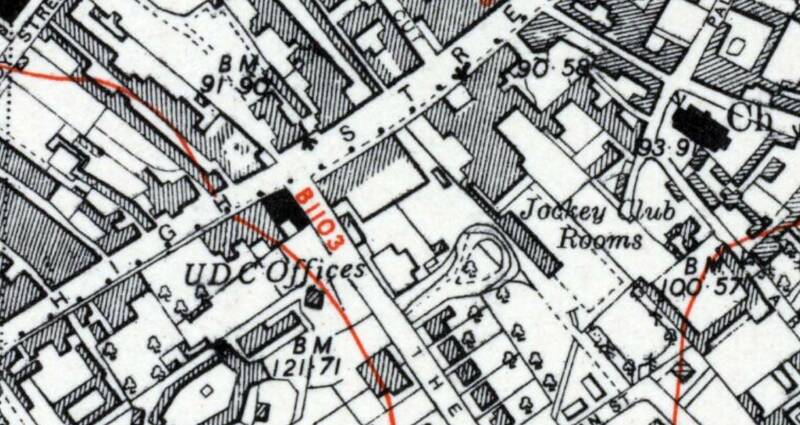 The location of the offices is clearly shown on the 1950 map below, shaded in black at that location. And just before somebody asks the next question - maps have a habit of showing slightly out-of-date information, particularly large officious maps such as this, so it's no surprise that a map from 1950 is still showing the UDC Offices at Godolphin House, even though the Bury Free Press article clearly above shows that they'd moved here to Severals House in 1948. Newmarket UDC agreed to purchase Stratford House, Old Station Road for its offices and meeting rooms. There was space to construct a council chamber and the price of £900 was reasonable. They could bring all their staff under one roof instead of being divided between Godolphin House and Hadley House and have offices worthy of the council. But they rejected proposals to purchase allotment land on which to build a central school. Hadley House is No.92 High Street - the 1936 Newmarket Directory lists that as being the Urban District Council Rating Office at that time. Edward Francis Clayton's family originally came from Northumberland. He was commissioned in the Scots Guards from the Militia in May 1887. In 1892 he was appointed ADC to the Governor of New Zealand and in October 1901 was appointed ADC to HRH The Duke of Connaught, then Commanding Land Forces in Ireland. He attended the 1902 Coronation as ADC and with the additional duty of `Silver Stick`. He was placed onto the Reserve of Officers in 1910. Edward married the daughter of Baron de Fougeres (Alexandre Leon Raymond Crublier de Fougeres) who was Councillor-General of the Canton d'Ardentes, a town located in the central region of the Loire valley in France. As can be seen by the details in the Building Changes section below, the Claytons moved into Severals House in 1919, just after WWI, but it was only a few years later that Edward died there on 19th April 1922. The funeral of Major Clayton will take place Newmarket Cemetery tomorrow at 3 p.m.
Major Clayton served in the Guards the Boer War, and was wounded in the throat. Princess Mary and Lord Lascelles were to have stayed Severals House next week. At the funeral of the late Major Clayton yesterday afternoon at Newmarket the mourners included the widow, Master Jack Clayton, and Miss Clayton (son and daughter), Mrs. Douglas (sister), Mr. Savilo Clayton (brother), Mr. Mark Renwick (brother-in-law), General Sir Frederick Charles Stanley and Lady Stanley, and Major Beynon. The first portion of the service at St. Agnes’s Church was fully choral. Among present were Lord and Lady Wolverton, Miss Marion Glyn and Mr. Nigel Glyn. Mr. and Mrs. Thomas Baring, Mr. Baron, Mr. Richard Baring. Lady Miller, Lord George Dundas. Mr. and Mrs. Sir Ernest and Lady Ladue. Capt. S. If. Darling, Captain O. E. Griffiths, and Mr. R. J. Marsh, Dawson, George Blackwell. Willie Waugh. Charles Waugh, and Percy Peck. A wreath of white flowers, lilies, carnations, and roses, tied with white ribbon, was sent with deepest sympathy Viscount Lascelles and Princess Mary. Many other wreaths were from Lord and Lady Wolverton, Lady Miller, Maud Countess Fitzwilliam of Wentworth Wodehouse. Lady Barbara and Mr. Gerald Dudley Smith. Hon. Mr. and Mrs. George Lambton, Mr. Richard Clayton, of Wylam. Colonel and Mrs. N. C. Swan, Mr. and Mrs. Thomas Baring, Mr. Baron, Mr. Richard Baring. Henry George Charles Lascelles, 6th Earl of Harewood married Princess Mary, the only daughter of King George V - Princess Mary was therefore the aunt of our present Queen. It's very clear from these newspaper announcements that once again we have with Major & Mrs. Clayton another very strong link between Newmarket and the Royal family. 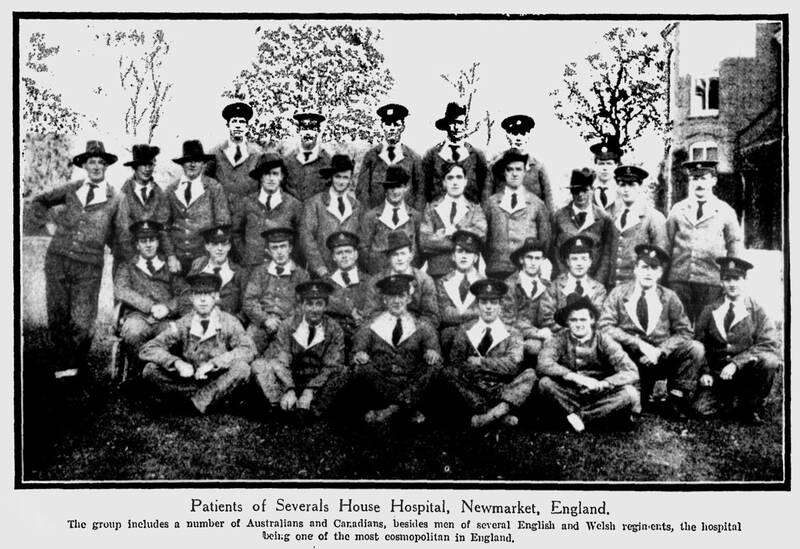 HOSTESS TO ROYALTY Mrs. Jeanne Clayton, of Severals House, Newmarket, underwent an operation in a Cambridge nursing home on Saturday. 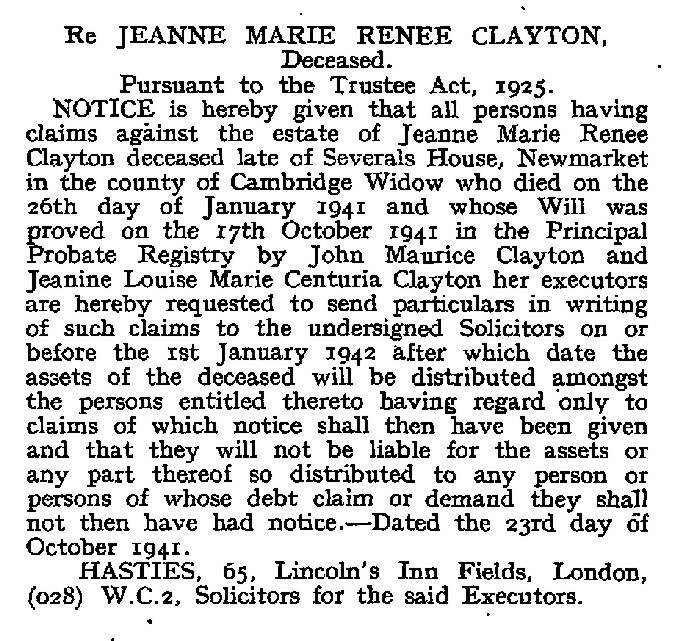 Jeanne stayed in Severals House until her death on 26th January 1941. Edward and Jeanne's son John Maurice, better known as Jack Clayton moved to Newmarket in 1929 and purchased next door Bedford House and stables - No.7 Bury Road. He became quite a famous racehorse trainer and details about him can be found on the page for Bedford Lodge. The contents of the house here were auctioned-off in 1916; so presumably this is when it ceased to be used as a private residence. Marquess of Londonderry & Sir Maurice FitzGerald, bart. C.V.O., J.P.
Charles was born on 16th July 1852 in London and succeeded his father in the marquessate in 1884; so presumably it was he who is listed here in Severals House in Kelly's Directory in 1988 and White's Directory in 1892. Sir Maurice was born in 1844 on the Island of Valentia in Ireland. On 4th October 1882 Sir Maurice married Amélie Catherine 'Lilly' Bischoffsheim, the younger daughter of Henri Louis Bischoffsheim (more details about him below). The marriage of Sir Maurice Fitzgerald, Bart., hereditary Knight Kerry, and equerry H.R.H. the Duke of Connaught, with Miss Bischoffsheim, is arranged to take place Wednesday this week. Major Talbot Crosbie, his kinsman and brother rifleman, will be best man the occasion. The bride elect no stranger to Ireland, where her sister, Lady Desart, has made herself most popular. Glanleam, in the island Valencia, the family residence of the Fitzgerald family ; and a most isolated place it is. But it is not improbable that Sir Maurice will build on his estate at Ballinruddery, which well wooded, and known to gunners as a capital place for woodcocks. On 30th April 1908 Maurice & Amélie's daughter; Louise Nesta Pamela FitzGerald, married Captain Lord Richard Wellesley, the son of Colonel Arthur Charles Wellesley, the 4th Duke of Wellington. Richard served in the Boer War, and sadly was killed during the First Battle of Ypres, near the village of Gheluvelt in Flanders, on 29th October 1914. 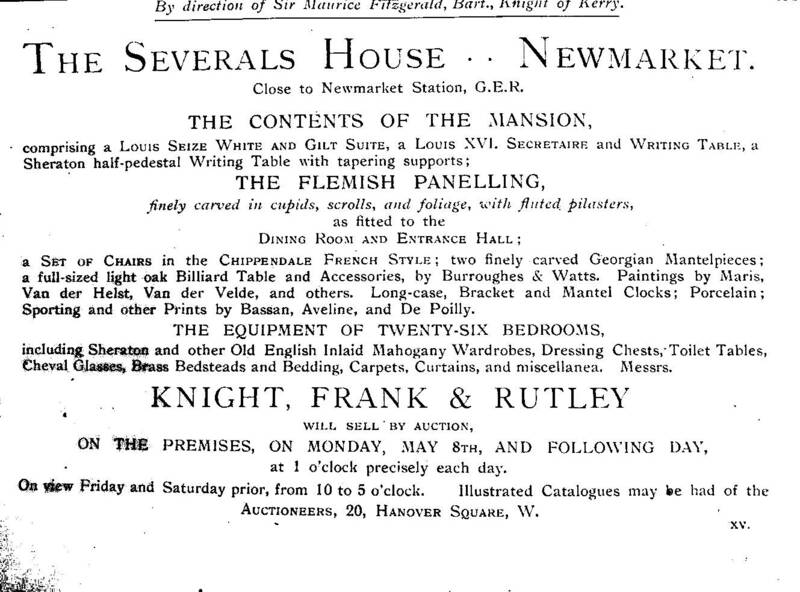 The Marquess of Londonderry died on 8th February 1915 and Sir Maurice in 1916; so it wasn't long after then that the house contents were auctioned-off (as shown in the catalogue details above). Although never shown in any census or trade directory the previous occupant in the house was the wealthy Jewish banker Henri Louis Bischoffsheim. Ernest Cassel, who was associated with the Memorial Hall - No.144 High Street and Moulton Paddocks in Newmarket, worked for Henri at the Bischoffsheim and Goldschmidt bank in London. Over the next three decades, Bischoffsheim’s fortunes continued to grow; the establishment of a new Stock Exchange in London in 1885, backed by firm adherence to the gold standard, helped enormously. He went on to purchase The Severals in Newmarket (next to Louis Rothschild’s Palace House) and Warren House, the 90-room mansion at Stanmore, Harrow, built by British Museum architect Sir Robert Smirke. Between his racing parties at The Severals, the weekenders at Warren and his dinner parties at Bute House, Bischoffsheim became the epitome of a city magnate absorbed into the political establishment. Despite his Jewish background, he nevertheless became something of a star in London Society a favourite at the Court of the Prince of Wales and an indispensable fixture in the Season. At the time of his daughters’ marriage to the 4th Earl of Desart, he was said to give the best dinner parties in London; his wife, Mrs. Bischoffsheim, together with Mrs. Oppenheim, held absolute influence over feminine fashion in the city. He was even accepted as a member of the Carlton Club, hitherto the exclusive preserve of the landowning classes. By the time of his death in 1908, Bischoffsheim was one of the wealthiest men in Europe. On 29th April 1881, at Christ Church in Down Street, Mayfair, Henri's eldest daughter Ellen Odette Bischoffsheim married William Cuffe, 4th Earl of Desart. Her married title was the Countess of Desart and she has been called 'the most important Jewish woman in Irish history'. On the 1881 Census it shows that there was a house being built at this location, between Prince Soltykoff's house (The Kremlin) and Warren Cottage - No.5 Bury Road - presumably therefore this was Severals House, though it's not presently known who commissioned its construction. It was completed by 1884 as shown in the map below, so it does seem most likely that it was the Bischoffsheims who were the first occupiers. Before Severals House was built at this location in around 1881, stretching between the Bury and Fordham Roads, upto and probably beyond the present railway line was a 200acre farm known as Severals or Severalls Farm. William and Robert are shown here together on the 1861 census, though by 1871 it was just William. Then 10 years later in 1881 William and his son (another William) had moved back to their home village of Kirtling and William junior was now the farmer at Hall Farm. Freehold estate in Soham, Ely St. Mary, Stuntney and Isleham, called Soham Place, comprising a mansion, several farms, house, and mercantile properties, and building and accommodation lands, more than 2,238a., with picture of Soham Place itself and plans, property of trustees of the late John Dobede. 2,238acres is a considerable estate of land and by his death his holdings also included the complete Exning Estate, which was another 2,863acres, stretching upto and around Newmarket, to include the whole section of land against the Cambridge Heath ... and also this plot of land upto the Bury Road. John's early life was at the family estate of Soham Place, then in 1855 he moved into Exning Hall where he later died in 1875. He left the hall to his son Henry Dobede. Then in 1881 the estates were put up for sale, details for the Exning estate can be seen on the page for No.156-160 High Street - Ratcliffe House. Clearly the date of the sale of the land and the building of Severals House, both in 1881, confirm that this was the transition from a working farm here to a 'Racing Box' (a second home used solely for the purpose of attending the racing, in this instance at Newmarket). The inhabitants of this town were thrown into a state of considerable excitement and alarm on Tuesday evening last, by a sudden and startling report that a serious accident had occurred in the tunnel under the exercising heath to an up mixed train. The report which rapidly circulated through the town was first disbelieved by many, but on reaching the Railway Station they were convinced of the fact ; but the anxiety of the excited public was somewhat assuaged by the prompt reply of the officials that no loss of life, or even injury to anyone, had been occasioned thereby. It appeared that the heavy fall of snow and the unusual force of water from Warren-hill, under which the tunnel runs, occasioned no doubt by the rapid thaw, had seriously effected the walls and a portion of the crown of the tunnel, and caused a fall of earth and brickwork near the mouth of the tunnel the station-end under the public road ; and as this debris was unperceived by anyone, the engine of the 5.40 mixed train from Bury St. Edmund’s ran upon it and was thrown from the metals with force that caused it to reel against the wall of the tunnel and then rebound, still rushing along for about thirty yards with five loaded waggons also off the line, till its pent up power was exhausted by the wheels being deeply embedded in the soil, and its huge body thrown with violence upon its side, and considering the peculiar position which the engine fell, it can hardly be conceived how the driver and his fireman escaped uninjured, as they did. The rear of the train, viz. fifteen waggons, a break van, and two carriages, remained upon the rails, and so slight was the shock, that the five passengers who occupied the two carriages at the moment of the stoppage, imagined that they had arrived at the Newmarket station. Much concern was at first felt for the safety of the passengers, and as soon as it was ascertained that they were unhurt, Mr. Heavens the station-master, despatched an omnibus to the further end of the tunnel, near the Severals Farm, in which they were conveyed to the Station ; and the same means were adopted to carry the passengers who arrived by the succeeding down express to Kennet Station ; and this mode of traffic was continued until about mid-day on Wednesday, at high time a platform, of a novel and convenient structure, was erected at the Kennet end of the tunnel, at which the train from Bury deposited their passengers, who were there received by omnibuses, and conveyed overland to the Newmarket Station, at which a train was in readiness to continue the usual route to Cambridge and London, so that with the conveyance of passengers both the up and down trains, omnibuses were constantly plying from one end of the tunnel to the other. The goods and cattle traffic over this line is entirely stopped, and what carried on is from Newmarket via Cambridge, Norwich, and Haughley, thence to Bury Saint Edmunds. On a close examination of the brickwork of the tunnel, it was found that in consequence of the heavy body of water that had flowed down the opening of the tunnel and washed away the earth from the abutments, between 50 and 60 feet of the support walls had bulged in and given way. Large companies of men are employed night and day, in shoring the walls, and repairing the dangerous portions, and it is considered that with every exertion that be made, traffic cannot resumed during the next week. PROJECTED RAILWAY FROM ELY TO NEWMARKET, via SOHAM. On Friday last a meeting of gentlemen interested in the project for the construction of a line of railway from Ely to Newmarket, via Soham, was held at the Crown Inn, Soham. There was a very good attendance, and amongst those present were the Rev. H. Tasker. Vicar of Soham, Messrs. Brown, Butcher, Clements (Soham), Fyson, Giscar, C. Hustwick (Soham). T. Hustwick, J. A.Johnson (Wicken), - Johnson, jun, Mainprice, , (Soham), Neale (Ely), J. Read, jun.. (Mildenhall, Robins , (Isleham), James Seamier, A. Slack. Slater, Taylor (Bishop’s Stortford). Mr. E. Cross, of Ely (Solicitor to the promoters). Mr. Wilkinson (Engineer), and Mr. Toogood Parliamentary Agent), were in attendance, and the Engineer produced a plan of the projected line for the inspection of those present. The motion of the Rev, H. Tasker, Mr. J. A. Johnson was called the chair, and requested Mr. Cross to state the present position of the undertaking. .... held at the Crown Inn, at Soham, on Friday, the 20th inst., when, as on the previous occasion, there was a large and influential attendance. A letter was read from Lord George Manners, M.P., who was unable to be present. and the Rev. Canon Tasker, the rector of Soham, said that Mr. Dobede had requested him to say that he (Mr. Dobede) could not attend on account of the dangerous illness of his son. The rev. gentleman then proposed that Mr. John Appleyard Johnson, of Wicken, take the chair. The Chairman, in opening the proceedings, expressed his regret at the absence of Lord George Manners and Mr. Dobede, especially the occasion which prevented the attendance of the latter gentleman. Being called upon unanimously to occupy the chair, he should not be justified in refusing the compliment. No preliminary remarks from him were necessary, because they all knew the subject they had met to discuss ; viz., the expediency of having a railway from Ely to Newmarket, Soham. Ten years after these articles Soham station opened in 1879 when the Ely to Newmarket railway line was eventually built. Sadly though the link-line that was constructed between Newmarket and Soham at Chippenham junction has now been removed; so unfortunately this journey is no longer possible. Though the section from Bury St. Edmunds, through Kennett and onto Ely still exists.